Plastic Gospel Story by Colours - Gospel Easter Egg with Dog Tag. Filled with a durable plastic dog tag. 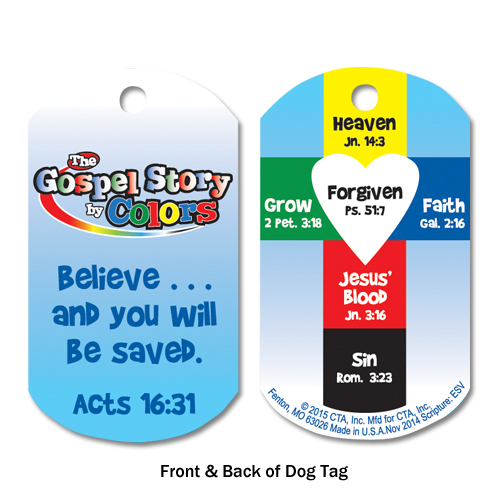 Dog tag features The Gospel Story by Colors, which explains, through colors, how we are forgiven sinners through Christ. Also includes a 30" breakaway ball chain. Theme Bible verse is Acts 16:31, "Believe in the Lord Jesus and you will be saved." Recommended for ages 5+. Handout one per child at the end of community Easter egg hunts, give away at Sunday school or other Christian children's ministry events. Gospel Easter Egg with Dog Tag was published by CTA in January 2015 and is our 652nd best seller. The ISBN for Gospel Easter Egg with Dog Tag is TDGCB5EG. Be the first to review Gospel Easter Egg with Dog Tag! Got a question? No problem! 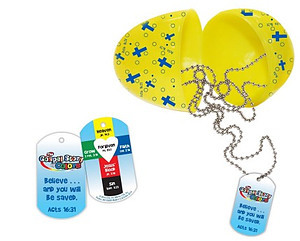 Just click here to ask us about Gospel Easter Egg with Dog Tag.